Just in time for Halloween, some real-life witches have been found over in Italy. Also appropriate for the season, the witches are dead and buried, as it turns out they were discovered in a graveyard that's suspected to have been created specifically for ladies believed to have supernatural powers. 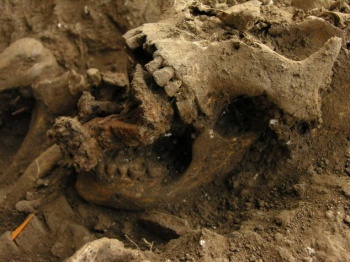 The graveyard was found in Italy's Tuscany region, and the remains discovered therein are approximately 800-years-old. One of the sets of remains was of a woman who had seven nails driven through her jawbone. Another female skeleton was found seventeen dice, which is notable because this was "a game which women were forbidden from playing 800 years ago." "It's a very unusual discovery and at the same time fascinating. I have never seen anything like this before. I'm convinced because of the nails found in the jaw and around the skeleton the woman was a witch. "She was buried in bare earth, not in a coffin and she had no shroud around her either, intriguingly other nails were hammered around her to pin down her clothes. "This indicates to me that it was an attempt to make sure the woman even though she was dead did not rise from the dead and unnerve the locals who were no doubt convinced she was a witch with evil powers. "The second skeleton we have found was buried in a similar fashion but this time we found 17 dice around her - 17 is an unlucky number in Italy and also dice was a game that women were forbidden to play. "The way the bodies were buried would seem to indicate some form of exorcist ritual and the remains will be examined to see if we can establish a cause of death for them." OK, let's be honest about something here. Last week, a burial site for zombies was discovered over in Ireland. Now, we've got witches. Who wants to bet next week reveals the existence of vampires (who, y'know, eat people instead of sitting around and whining while they sparkle)?